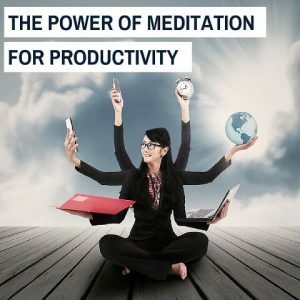 Just in case you ever wondered what meditation and productivity have in common, this will help. I used to think that if I was busy all the time thinking about and doing stuff that I was being productive. What I discovered though after years of meditating and running businesses is that being productive, and being effective, are two different things. These days our minds are being consistently overworked because of the numerous distractions that bombard our senses from every direction. From thinking about all the tasks we have to get done through the day, to being hyper-connected to the world around us via our mobile devices, it’s a wonder we get anything of consequence done at all. Being busy at work does not necessarily mean that we are being effective, or using the time we have wisely. I remember a job I had in the government that was so boring that I had to pretend to be busy most of the time because my daily work was completed in just a few hours as I worked considerably faster than the rest of the team. All too often in the workplace today time is being wasted focusing on things that are non-productive, while the ability to stay focused on one task at a time until it is complete is rapidly diminishing. In fact, one of the biggest issues that many business face today with their staff is that they lack focus. So where does this lack of focus come from? It comes from the mind being conditioned to look for distractions so that it can stay entertained. This has come about as technology continues to push us into the world of digital lifestyles where people get to work, play, relate, and be entertained, all from the convenience of their mobile devices. The downside of this is that it seems to be getting harder for people to ‘switch-off’ from their digital lives, slow down their thinking, and get focused on doing what matters most in their work and in their lives. Meditation can help with this because it is offers you a way to step back from the busy mind and give yourself some space to gain clarity over what’s important. It also teaches you how to focus your attention on one thing at a time. This amplifies your ability to focus the mind and stay focused until you achieve the result you are looking for. In order for us to train the mind to be more focused and not so easily distracted we have to start with the basics. At first, you may find that when you start to learn to meditate and slow down the mind, that the mind pushes back and seems to get even more noisy and disturbed. When this happens, then you can work with the mind instead of letting it be the reason you quit before you even get started. The mind doesn’t like to slow down or be quiet as a general rule unless the brain has sent messages to the body that it is time to relax. The other way is to pay attention to the mind with an attitude of non-judgement. The essence of success in meditation comes from being non-judgmental towards our thoughts and feelings. The better you get at doing this, the faster the mind quiets down. It’s just like if you get upset with a child that has a tantrum, that doesn’t help at all – in fact it’ll most likely fuel it. But if you have compassion for the child and give understanding instead of judgment, then the child will eventually calm down. As soon as you start to accept your thoughts while meditating then the mind will go quiet of it’s own accord. This then allows you to step back from the busy mind and see things from a different perspective which enables your decision making process to be more effective. Step 1: Sit comfortably. If that’s not possible, then you can lie down some comfortable. Step 2: Take three slow, deep breaths. If you can, breathe in slowly through the nose and out slowly through the mouth. Step 3. Close your eyes. Step 4. Watch your breath. This is where you get to practice focusing your attention on something that is in the present moment. Simply watch the breath as it comes in through your nose and moves down through your body and then out through the nose. Your breath is natural and relaxed during this stage. Step 5. Bring your mind back. As soon as you notice that your mind has wandered to so other thoughts, feelings or physical sensations, don’t judge it – allow it. Then, gently bring your attention back to focusing on the breath coming in and moving out of your body. Step 6. Repeat steps 4 and 5 for anywhere from 5 to 20 minutes. Step 7. Finish your meditation by letting o of the need to do anything and relax for a minute or two in silence. It might seem strange that something as simple as watching your breath come in and go out of your body can train the mind to be more focused but if you think about it, it makes perfect sense. Our breath exists in the present moment, unlike the millions of other things we think about which are either past or future based. By focusing on the breath we get the additional benefit of being more present and as soon as we pay more attention to the present moment, our energy levels start to increase because we are not being drained by past or future thoughts that cause us to feel stressed or anxious. The longer we can focus the mind on one-thing at a time and stay connected to the present moment, the more productive and energized we are going to be. Just 10 minutes a day of mindful meditation can free your mind and bring you more calm, clarity, and focus, right from the comfort of your own home.